The most common question I get, by far, is how to lose weight. You may have seen some of the crazy products out there that guarantee results or your money back. Hollywood juice plans, Raspberry Ketone pills, the Shakeweight, and the Thighmaster are just some of the products that have sold millions but don’t really deliver on the long-term results that people are looking for. 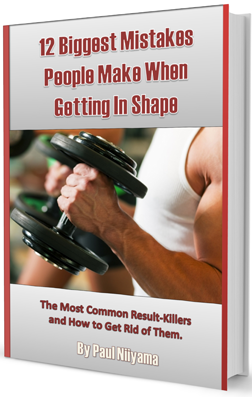 The only real way to get the long-term results that so many people are looking for is to find a way to make changes to your lifestyle that will cause you to burn fat and keep the muscle you already have. It sounds simple and obvious but there are countless people that still try and do an unhealthy crash diet. They think it’s a good thing because they lose weight but they have no idea if the weight is coming from water, muscle or fat. When it comes to losing weight, there are 2 methods that work for the long term. I’m usually training for size so I don’t really try to get cut up very often, but I have done both of these and saw good results from both. The first way involves a balanced or low-fat calorie-restricted diet. Basically you eat a good amount of protein and reduce your fat and carbs to consume less calories than you burn. You need to make sure you count your calories and make sure they are not too high or too low. This type of diet plan is based around the eat less, move more principle. A typical 30% protein, 40% carbs and 30% fat seems to be an ok place to start with the macros although I have had clients use diets with higher carbs and less fats and still see good results. The good thing about this plan is that you don’t need to cut out a lot of foods except for a bunch of junk. You get to have things in moderation as long as you are getting your protein. The bad thing is that since the calories are lower than what you are burning, your energy levels sometimes drop and that can affect your workouts or your daily activity. When I was doing it, I had a lot of cravings for more food and felt hungry a lot. The biggest challenge for my clients are usually finding the right balance of calories so the weight they lose is from fat and not from muscle. The second way to lose weight is with a low carb, high fat diet. I used to think these were a fad and a bunch of crap, but there is a lot of scientific evidence that suggests that these are actually healthier and more effective than low -fat calorie-restricted diets. With this method you still want to eat a good amount of protein, but this time you are reducing your carbs, upping your fats. Avoiding certain foods like most carbs is the key. You don’t want your calories too high or low with this plan, but tracking your carb intake is more important than your overall calories. When I did this plan, I did not feel hungry all the time (after the adjustment period) and unless I was working out, I did not worry too much if I had to skip a meal. The bad thing is that you are eliminating most of your carbs, which can be tough for some people since they are so ingrained into our way of eating. My workouts did suffer and my strength went down when I was doing this nutrition plan. I think that’s pretty normal for all weight loss plans though… they are for losing pounds and not for increasing performance, after all. The worst part was the adjustment period. When you start this you will feel like crap for a while. Your body is used to having carbs for your energy and it takes some time for the body to start to use fat for energy. For myself it took a few days to get used to it. The length of the adjustment period is different for everyone though. I have heard of some people needing over a month…. Ouch! After the adjustment period I felt fine and actually had more energy throughout the day, that is of course, except for my workouts. So those are the two best methods for losing weight. Although the low carb method works better for most people, compliance is the biggest key so if you can’t cut your carbs a more balanced plan may work better for you. Remember not all plans work for all people. Before starting a nutrition program check with your doctor to see if you have some kind of pre-existing medical condition that could make the plan ineffective or even dangerous for you. As for what I did… keep reading. Like I mentioned previously, I’m usually not cutting. My fitness goal is normally to get as big and as strong as possible because when I look at pictures of myself I think I look better big, than small. Anyway, I was going back home visit family in Hawaii. I didn’t want to look like a total fatty in the pics on the beach so I decided to abandon my strength and size goals for a bit and get cut up. My starting stats were not bad, but I wasn’t really jacked or ripped. I had done a calorie restricted diet the last time I cut up. It was a looooong time ago. It took a few months but I got pretty ripped, but I also didn’t have a family so I had a lot more time to work out and could really control my portions and meal timing. I also remember feeling like crap a lot and being hungry most of the time. Since there was so much positive research on the effectiveness of low-carb diets, I decided to do that instead of what I’d done in the past. Atkins, Paleo, and South Beach are some of the more popular low carb plans. The name doesn’t really matter though because even though there are some differences between the plans, they all have rely on the same basic concept of reducing carb intake. There are a few different reasons why low carb plans work well. Carbohydrates cause the body to release insulin. The higher a food is on the glycemic index, the more insulin will be released. A lot of insulin in the body can cause you to store fat and prevent you from burning fat. This is exactly what you don’t want if you are trying to lose weight. Reducing insulin levels is a major reason that people see results from low carb diets. Carbohydrates also helps to hydrate the body so reducing your carb intake will cause the body to store less water. This isn’t actually helpful for burning fat since the weight lost will be from water, but if dropping pounds is important to you, this is a benefit. Another possible benefit of a low carb diet is a metabolic state known as ketosis. This is where the body uses ketone bodies as it’s main source of energy instead of glycogen. The good thing about ketosis is that the ketone bodies are produced from fat, so essentially you are using your stored fat as energy. Yes… when you are in ketosis you are burning your fat. Your body will start to produce ketones when the stored glycogen is depleted. Glycogen is the stored form of the sugar glucose. So when you cut your carbs the body will have no glucose to store so the body will start to make ketones quicker. You will also need to watch the protein consumption if you are trying to get into ketosis. A common mistake people make is going high protein, low carb and moderate fat with their macros. Insulin levels can also be raised by protein and the body can also convert protein into glycogen so the correct way to implement a low carb diet is to have a lot of fat and moderate protein. I often refer to low carb diets as keto or ketogenic diets even though it is not necessary for the body to be in total ketosis to burn fat. The exact amount of carbs you need will vary from person to person. Some people can be in the 80 grams per day range but some people will need to be under 50. I usually try to get my clients to have less than 50 net carbs per day. (Net carbs is the total carbs minus fiber.) To see what actually works for you ketostix are a good tool to test your how your body is reacting. Going into total ketosis is not for everyone, but it is usually safe for most (except if you have some sort of pre-existing medical condition.) Don’t get ketosis confused with, the similarly named, dangerous condition known as ketoacidosis. This is where the body has an extremely high level of ketones and is unable to regulate it’s production. Now that you have a little bit of background on why I went for a low carb, high fat diet, let me go over some of the basics of what I did. Basically avoid sugars and starches. Carbs should come from veggies and some fruits. Opt for high fat foods and make sure there is enough (but not too much) protein. My main focus was to make sure I had enough protein every meal. I ate eggs and ground beef a lot. I also made sure my fats were high. I ate a lot of avocadoes and almonds to increase my fat intake. Except for some fruits my carbs were almost non-existent. My food tracking was pretty horrible. I did not track my food intake or measure my foods but I would guess that my calories were around 2,200 a day. If I planned that I would be writing about this one day, I would have tracked everything much better. Eggs: Whole eggs. Eggs are a great source of complete protein. The yolk has a lot of nutrient and a lot of fat. Fats: Coconut oil, avocadoes, olive oil, butter, lard and other saturated fats. Saturated and monounsaturated fats are good because they are more stable and less inflammatory than polyunsaturated fats. Vegetables: Spinach, kale, broccoli, cauliflower and any other non-starchy, non-root vegetables. Nuts: Almonds, Walnuts and pecans. Nuts have a lot of fat, which is good, but be careful of the carb content. Some nuts, like cashews, have more carbs than others. Legumes: Beans have some protein and fiber but they have a lot of carbs so watch your portion size. Lower glycemic load Fruits: Berries, apples, pears are good choices but they still have a lot of sugars so be careful how much you eat. Click to see which foods have a high or low glycemic index. Dark chocolate: 85% cocoa or better dark chocolate is ok, but in moderation. This should not be eaten very much or very often. The main reason this is here is to curb any cravings and help you stay on track. Full fat dairy products: Milk, cheese, yogurt and cream are actually good sources of high fat protein. Dairy is kind of a gray area though. Besides the potential lactose intolerance, some people have a hard time losing weight with dairy and some don’t. It’s very individual. If you don’t have a problem losing with dairy… go for it. If you do, avoid it. Sugars: Anything with sugar or high fructose corn syrup. (They are basically the same thing.) That means soda, candy, desserts, fruit juices, etc. Click here to see more of the harmful effects of sugar. High glycemic fruits: These have a lot of sugar also. Fruits like bananas, dates, figs and grapes all have high glycemic indexes and loads. Fruits that are overly ripe will also have high sugar content. Grains: Wheat (Bread, Pasta, Cereals, etc) Rice, Oats, Corn and any other grain… even quinoa. Yes, even quinoa. These all have a lot of carbs and even the “healthy” versions of them like brown rice and whole wheat pasta are no-nos. Tubers: Potatoes, sweet potatoes, yams, etc. The Paleo diet allows these but they are all high carb foods that rate pretty high on the glycemic index. Avoid them. Polyunsaturated seed oils: Canola, Soybean, Corn, Safflower, Sunflower, Grape seed and any other polyunsaturated oils. These are pro-inflammatory and are unstable at high heat so these should be cut. Check your food labels since they sneak them into a lot of foods. Artificial Sweeteners: Aspartame (Equal), Sucralose (Splenda), Saccharine (Sweet N Low), and any other sweetener. This is a tough one to avoid, especially since so many protein powders have artificial sweeteners. I just tried to keep it as low as possible. There is some evidence that supports and some that refutes the hypothesis that artificial sweeteners still elicit an insulin response. I aired on the side of caution and avoided them when possible. Weights: I kept up my workout intensity through the cut. Contrary to the way most people lift during a cutting phase, I tried to keep my weights as heavy as possible with less reps. Most people will lower the weights and do more reps. I wanted to keep as much muscle as possible so I kept the weights high. Since my strength was suffering from the decrease in carbs I was not able to get as many reps. My rep range shifted from the standard 8-12 down to around 5ish. Although my strength went down but I did not lose too much muscle mass because of the heavy weight. The last time I did a cut I did it the conventional way with lower weights and lost both strength and muscle size. I focused on multi-joint strength movements like squats, deadlifts and bench press. Once I finished the major movement for the day, I then shifted to more detail work that sometimes would use single joint exercises or machines. Cardio: During a cut, some people like to go lower intensity for a longer duration while others prefer a higher intensity for a shorter duration. I prefer the latter. I think that nutrition is the biggest factor in the weight loss and cardio is not as important. If diet, workout and sleep are all good, the cardio will help accelerate the fat loss, but it won’t replace those components being done correctly. I used high intensity interval training when I was trying to cut. My rationale was it got the bang for the buck, time-wise. Click here for more info on getting the most out of your cardio. Since I only had about a month before my trip, I did not do cut for very long. I think my results were a little better than I would normally expect for that time period. The goal for my clients is usually to lose about 10 pounds a month so the 12.4 pounds is slightly quicker but nothing too outlandish. I could probably pinpoint what helped the fat loss if I tracked my foods better, but I can only make assumptions at this point. My first guess would be my normal lack of cardio. Adding in some HIIT training probably helped a bit with the fat metabolism, especially since my body was probably using fat for the energy. The other major change was the cutting of carbs. My normal carb consumption is pretty high. Cutting them was a big change for my body. Consistency is would be my third assumption. I kept my diet pretty clean. When I had a planned “cheat meal” it was not some crazy desert or anything like that. My “cheat meal” was usually a normal meal with brown rice or something boring like that. I did lose a little bit of muscle and I think I could have decreased that even further if I was tracking what I was doing. I currently have a few injuries that I’m trying to get over. Once I can do all my major lifts properly again, I will start bulking up again. Hopefully my body will cooperate and I can get back to lifting hard again soon. This time I plan to track things which will make it easier to adjust and make better guesses on what went right and what did not go as planned. Please subscribe to the newsletter and you can get updates on the latest articles. If you enjoyed this article, share it with someone on facebook or join the facebook group. Thanks for reading.